This email is a follow-up to our phone conversation about the IceProbe for your 10 gallon horseshoe crab fish tanks. Whether the ice probe would be safe with her tiny horseshoe crabs (It can be installed on the side of the tank based on the box, so I'd assume it's fine) 1. The chiller cools continuously when powered. In most aquarium implementations, the CoolWorks Proportional Temperature Controller is added to regulate the IceProbe’s cooling power. 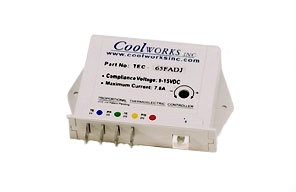 CoolWorks offers two Proportional Temperature Controllers for aquarium applications. Our TEC-65 controller is designed for tropical water aquarium environments, with an adjustable temperature range of 65ºF to 85ºF. Our TEC-45 is designed for cold water aquarium environments, with an adjustable temperature range of 45ºF to 65ºF. 2. Because the probe can be installed on the side of the tank, it should be fine for your horseshoe crabs.